The ST371HD is the perfect machine for everyday sewing and mending on everything from durable outdoor fabrics to lightweight elegant silks. Including a metal needle plate for smoother fabric feeding, and heavyweight needles, the ST371HD can handle layers of heavier fabrics. Also included are 37 utility and decorative stitches for blind hems, stretch stitches, buttonholes, zipper insertion, and more. 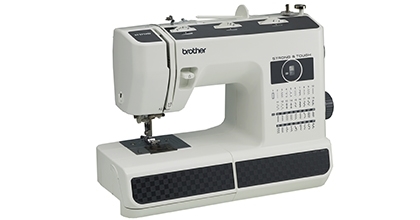 The ST371HD comes complete with 6 sewing feet, including a spring action zigzag foot, nonstick, blind stitch, zipper, buttonhole, and button sewing feet, Plus, the drop feed feature allows you to do free-motion sewing. The built-in handle allows the machine to easily go from sewing table to storage, when not in use. This machine also has a built-in easy needle threader, jam-resistant Quick-Set™ drop-in top bobbin, automatic bobbin winding system, and a free arm for sewing cuffs and sleeves. Included are an instructional DVD to help you get started, and an English and Spanish user manual.